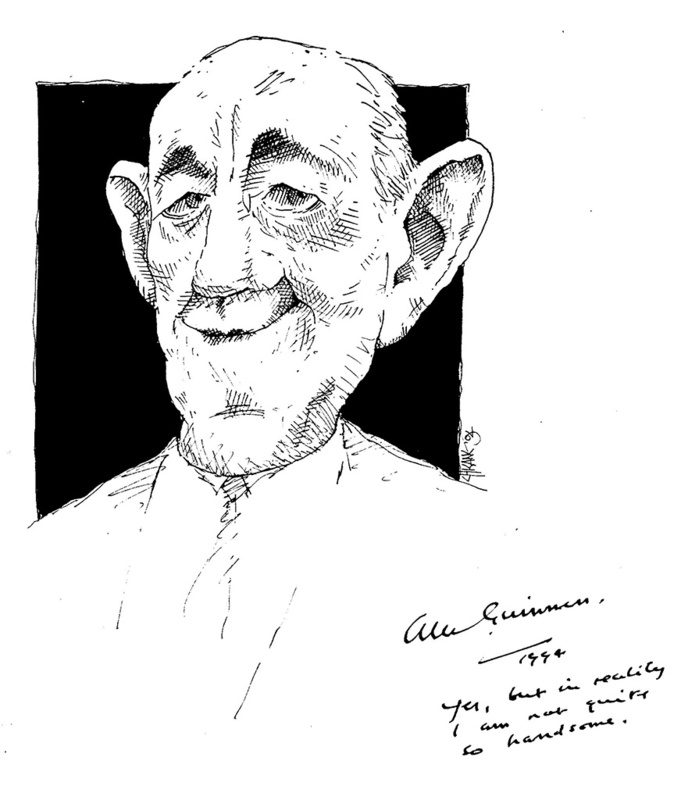 In a galaxy far, far away… actually, in 1994, I drew a quick caricature of Sir Alec Guinness. In the absence of a stage door to stand at or a reliable agent’s address, I found out that he was a member of The Garrick Club, Charing Cross Road in London. I was in the city at the time, so I made a couple of copies, wrote a note and left it with a stamped self addressed envelope before heading back to New Zealand. This month I read that the British Library had recently bought 1000 letters and 100 volumes of his hand written diaries from his family for £320,000. The archive will go on display next year. Catherine Ostler in the Daily Mail wrote: “To some fans, Sir Alec Guinness will always be remembered as Obi Wan Kenobi, the sagacious Jedi Knight of the Star Wars films. To others, he is The Bridge On The River Kwai’s resolute but misguided Colonel Nicholson. It is common knowledge he disliked the Star Wars trilogy and would throw away fanmail associated with it. he called it “fairy-tale rubbish”. In spite of an Academy Award and Golden Globe nomination for his role, the theatrical knight wanted the Jedi Knight killed off and convinced George Lucas that it would make the character stronger (and he wouldn’t have to go on speaking that bloody awful, excruciating, banal dialogue, he confided). There was no doubt Sir Alec was a complex man – a shy introvert who shone on stage and screen. Melvyn Bragg said he was the weirdest, strangest person he’d ever interviewed. But, back in 1994 he signed my drawing and added some self-mockery. Six years later he passed away,aged 86. I wonder if I’m mentioned in his diary dispatches. A visit to the British Library next year could be worth it. The force (and the graph) is indeed with me, always. This entry was posted in Celebrity, Film and Television, Theatre and tagged Alec Guinness, Autograph, Caricature, Drawing, Film, George Lucas, Harrison Ford, Laurence Olivier, Signature, sketch, sketching, Star Wars, Theatre by Mark Winter / Chicane. Bookmark the permalink.